There are a lot of different blister prevention and treatment products out there for your feet. There’s only one problem: All of them must stay in position to protect the blister or hot spot. The best blister product on Earth won’t do your chafing heel any good if it slips off and ends up on the bottom of your foot. The stickiest, best solution to this challenge? Tincture of benzoin. I’m blessed with extremely sweaty feet, which has given me the opportunity to test a range of blister products in a very high moisture environment. And sure enough, I’ve discovered that nothing sticks well to a sheen of sweat. Even if I stick something to completely dry feet, it soon succumbs to the sweaty foot tide underneath. And I’ve tried a lot of things: moleskin, molefoam, Spenco 2nd Skin, Blist-O-Ban, even nylon repair tape (one of the best, stickiest options actually). All of them work for a while, but they also all eventually slip. When I’m desperate for maximum adhesion I pull out the big gun: a small bottle of tincture of benzoin. Benzoin is a very sticky resin obtained from the Styrax genus of trees and shrubs, most of which grow in tropical and sub-tropical regions like southeast Asia and equatorial South America. (Most commercially produced benzoin resin comes from Thailand, Malaysia, and Indonesia.) 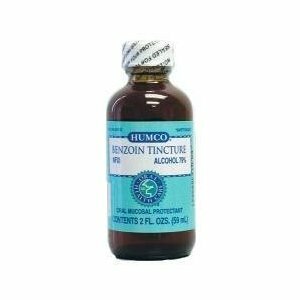 Tincture of benzoin is simply benzoin resin dissolved in alcohol. When it comes to dressings for blisters and hot spots, here’s how I use it. First, the application area should be completely dry; letting your foot dry this much requires patience if you’re dealing with it in the middle of a hike. Second, apply a thin layer of tincture of benzoin and let it air for a few minutes so the alcohol can evaporate, leaving the sticky stuff behind. Then place your preferred blister treatment on top of it. Tincture of benzoin can also be used to toughen up sensitive spots. Some hikers and athletes will apply it to known hotspots in the days or weeks prior to activity, creating a more blister-resistant layer of skin in high-friction zones. It is also widely used in first aid to provide better adhesion for bandages and medical tape. Tincture of benzoin is available at most drug stores; you may need to ask for it in the pharmacy. A one- to two-ounce bottle—good for dozens of applications—sells for roughly $10. If you’re saving weight, you can sometimes find it in single-use ampules.